Tiger Woods is close to becoming world No 1 againGraeme McDowell has work to do to be ready for the Masters. Tiger Woods? Not so much. As McDowell shot a listless 75 to slip close to the back of the field in the Arnold Palmer Invitational on five over, Woods had five birdies and an eagle in a six under 66 to take a two-stroke lead into the final round. An eighth career victory at Bay Hill would be the 99th win of Woods’ pro career and his 77th on the PGA Tour. It would also see him overtake the absent Rory McIlroy and return to the top of the world rankings for the first time since the end of October 2010 - two years, four months and 24 days ago. He leads on 11 under par from Rickie Fowler (67), john Huh (71) and joint overnight leader Justin Rose, who was four under after four holes but imploded under the Woods onslaught and shot a 72 to miss out of a place in the final group. 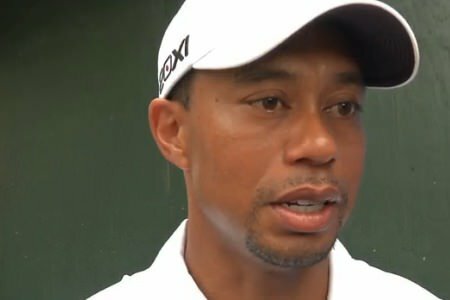 With a record of 40 wins from the 42 times he has the outright lead going into the final round, Woods looks almost unbeatable. But despite yet another imperius putting display - he made five big par saves in the first 10 holes and has averaged 26 putts for his last seven rounds since that putting lesson with Steve Stricker in Miami - he sounded a note of caution. He might just be playing down the hype in case of accident but a third win before the Masters would send him to Augusta as an even bigger favourite than he is already. As for McDowell, he went out with what he described on twitter as the “dewsweepers” but played more like another description he has used for the early morning starters - “the deadmen”. The stats say he his eight fairways, eight greens and had 11 single putts in a 25 putt round. There were three birdies and three bogeys but his day ended when he made a triple bogey seven at the tough 15th, knocking an ambitious second from the fairway trap out of bounds on the right. As for Woods, it was his putting that pleased him most. 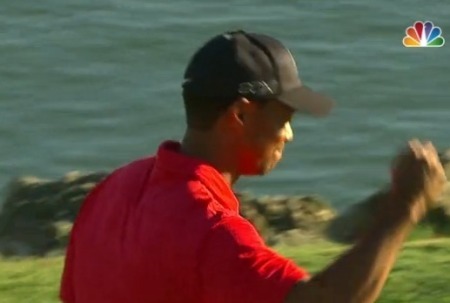 ”I made a few putts, and that’s what I was pleased with today,” Woods said. The short stick has been his nemesis many times over the past fouyr years and nine months since the last of his 14 majors wins. While he is still erratic off the tee, he has putted well this year and while there were wobbles down the stretch at Torrey Pines and Doral as he won the Farmers Insurance Open and the WGC - Cadillac Championship, he will be keen to retain his Arnold Palmer Invitational title today. Last year’s final round performance left McDowell heralding his return in awe. It didn’t translate into a major victory for the 37-year old Californian in 2012, however, and it remains to be seen if he can make amends this year. March 24, 2013 ????? ????? Padraig Harrington reckons an Irish golfer could become world No 1 for the first time. And he’s not ruling himself out of the race with Graeme McDowell and Rory McIlroy to reach top of the rankings. Graeme McDowell speaking at Bay Hill earlier this week. Graeme McDowell may have the game to compete with Tiger Woods but he needed all his famous fighting qualities just to keep the world No 2 in his sights at the Arnold Palmer Invitational. As for Justin Rose, the Englishman was simply in another league on the greens.